"Nerve gas" redirects here. It is not to be confused with neural gas. Nerve agents are a class of phosphorus-containing organic chemicals (organophosphates) that disrupt the mechanisms by which nerves transfer messages to organs. The disruption is caused by blocking acetylcholinesterase, an enzyme that catalyzes the breakdown of acetylcholine, a neurotransmitter. Chemical weapons are classified as weapons of mass destruction by the United Nations according to UN Resolution 687 (passed in April 1991) and their production and stockpiling was outlawed by the Chemical Weapons Convention of 1993; the Chemical Weapons Convention officially took effect on April 29, 1997. The use of dangerous gases in warfare is forbidden by treaties already in the Hague Conventions of 1899 and 1907 and Geneva Protocol of 1925. Poisoning by a nerve agent leads to contraction of pupils, profuse salivation, convulsions, involuntary urination and defecation, and death by asphyxiation due to a loss of control of the respiratory muscles. Some nerve agents are readily vaporized or aerosolized, and the primary portal of entry into the body is the respiratory system. Nerve agents can also be absorbed through the skin, requiring that those likely to be subjected to such agents wear a full body suit in addition to a respirator. As their name suggests, nerve agents attack the nervous system of the human body. All such agents function the same way: by inhibiting the enzyme acetylcholinesterase, which is responsible for the breakdown of acetylcholine (ACh) in the synapse. ACh gives the signal for muscles to contract, thus, if it cannot be broken down, muscles are prevented from relaxing. Initial symptoms following exposure to nerve agents (like sarin) are a runny nose, tightness in the chest, and constriction of the pupils. Soon after, the victim will then have difficulty breathing and will experience nausea and drooling. As the victim continues to lose control of their bodily functions, they will involuntarily salivate, lacrimate, urinate, defecate, and experience gastrointestinal pain and vomiting. Blisters and burning of the eyes and/or lungs may also occur. This phase is followed by initially myoclonic jerks followed by status epilepticus. Death then comes via complete respiratory depression, most likely via the excessive peripheral activity at the neuromuscular junction of the diaphragm. The effects of nerve agents are long lasting and increase with continued exposure. Survivors of nerve agent poisoning almost invariably suffer chronic neurological damage. This neurological damage can also lead to continuing psychiatric effects. When a normally functioning motor nerve is stimulated, it releases the neurotransmitter acetylcholine, which transmits the impulse to a muscle or organ. Once the impulse is sent, the enzyme acetylcholinesterase immediately breaks down the acetylcholine in order to allow the muscle or organ to relax. Nerve agents disrupt the nervous system by inhibiting the function of the enzyme acetylcholinesterase by forming a covalent bond where acetylcholine would break down (undergoes hydrolysis). Acetylcholine thus builds up and continues to act so that any nerve impulses are continually transmitted and muscle contractions do not stop. This same action also occurs at the gland and organ levels, resulting in uncontrolled drooling, tearing of the eyes (lacrimation) and excess production of mucus from the nose (rhinorrhea). The structures of the complexes of soman (one of the most toxic nerve agents) with acetylcholinesterase from Torpedo californica have been solved by X-Ray crystallography (PDB codes: 2wfz, 2wg0, 2wg1, and 1som). The mechanism of action of soman could be seen on example of 2wfz. Atropine and related anticholinergic drugs act as antidotes to nerve agent poisoning because they block acetylcholine receptors, but they are poisonous in their own right. 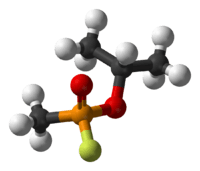 (Some synthetic anticholinergics, such as biperiden, may counteract the central symptoms of nerve agent poisoning better than atropine, since they pass the blood–brain barrier better than atropine.) While these drugs will save the life of a person affected with nerve agents, that person may be incapacitated briefly or for an extended period, depending on the amount of exposure. The endpoint of atropine administration is the clearing of bronchial secretions. Atropine for field use by military personnel is often loaded in an autoinjector, for ease of use in stressful conditions. Pralidoxime chloride, also known as 2-PAM chloride, is also used as an antidote. Rather than counteracting the initial effects of the nerve agent on the nervous system like atropine, pralidoxime chloride reactivates the poisoned enzyme (acetylcholinesterase) by scavenging the phosphoryl group attached on the functional hydroxyl group of the enzyme. Though safer to use, it takes longer to act. Revival of acetylcholinesterase with pralidoxime chloride works more effectively on nicotinic receptors while blocking acetylcholine with atropine is more effective on muscarinic receptors. Often, severe cases of the poisoning are treated with both drugs. Butyrylcholinesterase is a prophylactic countermeasure against organophosphate nerve agents. It binds nerve agent in the bloodstream before it can exert effects in the nervous system. Because it is a biological scavenger (and universal target), it is currently the only therapeutic agent effective in providing complete stoichiometric protection against the entire spectrum of organophosphate nerve agents. There are two main classes of nerve agents. The members of the two classes share similar properties and are given both a common name (such as sarin) and a two-character NATO identifier (such as GB). The G-series is thus named because German scientists first synthesized them. G series agents are known as non-persistent, while the V series are persistent. All of the compounds in this class were discovered and synthesized during or prior to World War II, led by Dr. Gerhard Schrader (later under the employment of IG Farben). This series is the first and oldest family of nerve agents. The first nerve agent ever synthesised was GA (tabun) in 1936. GB (sarin) was discovered next in 1939, followed by GD (soman) in 1944, and finally the more obscure GF (cyclosarin) in 1949. GB was the only G agent that was fielded by the US as a munition, specifically in rockets, aerial bombs, and artillery shells. Dr. Ranajit Ghosh, a chemist at the Plant Protection Laboratories of Imperial Chemical Industries (ICI) was investigating a class of organophosphate compounds (organophosphate esters of substituted aminoethanethiols). Like Gerhard Schrader, an earlier investigator of organophosphates, Ghosh found that they were quite effective pesticides. In 1954, ICI put one of them on the market under the trade name Amiton. It was subsequently withdrawn, as it was too toxic for safe use. The toxicity did not go unnoticed and some of the more toxic materials had in fact been sent to the British Armed Forces research facility at Porton Down for evaluation. After the evaluation was complete, several members of this class of compounds became a new group of nerve agents, the V agents (depending on the source, the V stands for Victory, Venomous, or Viscous). The best known of these is probably VX, with the Russian V-gas coming a close second (Amiton is largely forgotten as VG). This class of compounds is also sometimes known as Tammelin's esters, after Lars-Erik Tammelin of the Swedish National Defence Research Institute. The V-series is the second family of nerve agents and contains five well known members: VE, VG, VM, VR, and VX, along with several more obscure analogues such as VP. The most studied agent in this family, VX, was invented in the 1950s at Porton Down in the United Kingdom. VP (3,3,5-Trimethylcyclohexyl-3-pyridylmethylphosponate) is a "V-series" nerve agent closely related to the better known VX. Like most of the "V-Series" nerve agents, with the exception of VX, VP has not been extensively researched outside of military science. Little is known about it other than its chemical formula. All of the V-agents are persistent agents, meaning that these agents do not degrade or wash away easily and can therefore remain on clothes and other surfaces for long periods. In use, this allows the V-agents to be used to blanket terrain to guide or curtail the movement of enemy ground forces. The consistency of these agents is similar to oil; as a result, the contact hazard for V-agents is primarily – but not exclusively – dermal. VX was the only V-series agent that was fielded by the US as a munition, consisting of rockets, artillery shells, airplane spray tanks, and landmines. The Novichok (Russian for "newcomer") agents are a series of organophosphate compounds that were developed in the Soviet Union from the mid-1960s to the 1990s. The goal of this program was to develop and manufacture highly deadly chemical weapons that were unknown to the West. These new agents were designed to be undetectable by standard NATO chemical detection equipment and to defeat chemical protective gear. In addition to the newly developed "third generation" weapons, binary versions of several Soviet agents were developed and were designated as "Novichok" agents. A number of insecticides, including carbamates and organophosphates such as dichlorvos, malathion and parathion, are nerve agents. The metabolism of insects is sufficiently different from mammals that these compounds have little effect on humans and other mammals at proper doses; but there is considerable concern about the effects of long-term exposure to these chemicals by farm workers and animals alike. At high enough doses, however, acute toxicity and death can occur through the same mechanism as other nerve agents. Organophosphate pesticide poisoning is a major cause of disability in many developing countries and is often the preferred method of suicide. The method chosen will depend upon the physical nature of the nerve agent(s) used, the nature of the target, and the achievable level of sophistication. This first class of nerve agents, the G-Series, was accidentally discovered in Germany on December 23, 1936, by a research team headed by Gerhard Schrader working for IG Farben. Since 1934, Schrader had been working in a laboratory in Leverkusen to develop new types of insecticides for IG Farben. While working toward his goal of improved insecticide, Schrader experimented with numerous compounds, eventually leading to the preparation of tabun. In experiments, tabun was extremely potent against insects: as little as 5 ppm of tabun killed all the leaf lice he used in his initial experiment. In January 1937, Schrader observed the effects of nerve agents on human beings first-hand when a drop of tabun spilled onto a lab bench. Within minutes he and his laboratory assistant began to experience miosis (constriction of the pupils of the eyes), dizziness and severe shortness of breath. It took them three weeks to recover fully. In 1935 the Nazi government had passed a decree that required all inventions of possible military significance to be reported to the Ministry of War, so in May 1937 Schrader sent a sample of tabun to the chemical warfare (CW) section of the Army Weapons Office in Berlin-Spandau. Schrader was summoned to the Wehrmacht chemical lab in Berlin to give a demonstration, after which Schrader's patent application and all related research was classified as secret. Colonel Rüdiger, head of the CW section, ordered the construction of new laboratories for the further investigation of tabun and other organophosphate compounds and Schrader soon moved to a new laboratory at Wuppertal-Elberfeld in the Ruhr valley to continue his research in secret throughout World War II. The compound was initially codenamed Le-100 and later Trilon-83. Sarin was discovered by Schrader and his team in 1938 and named after their initials: Schrader, Ambrose, Rüdiger and van der Linde. It was codenamed T-144 or Trilon-46. It was found to be more than ten times as potent as tabun. Soman was discovered by Richard Kuhn in 1944 as he worked with the existing compounds, the name is derived from either the Greek 'to sleep' or the Latin 'to bludgeon', it was codenamed T-300. Cyclosarin was also discovered during WWII but the details were lost and it was 'discovered' again in 1949. The G-series naming system was created by the United States when it uncovered the German activities, labeling tabun as GA (German Agent A), sarin as GB and soman as GD. Ethyl sarin was tagged GE and cyclosarin as GF. In 1939, a pilot plant for tabun production was set up at Munster-Lager, on Lüneburg Heath near the German Army proving grounds at Raubkammer. In January 1940, construction began on a secret plant, code named "Hochwerk" (High factory), for the production of tabun at Dyherrnfurth an der Oder (now Brzeg Dolny in Poland), on the Oder River 40 km (25 mi) from Breslau (now Wrocław) in Silesia. The plant was large, covering an area of 2.4 by 0.8 km (1.5 by 0.5 miles) and was completely self-contained, synthesizing all intermediates as well as the final product, tabun. The factory even had an underground plant for filling munitions, which were then stored at Krappitz (now Krapkowice) in Upper Silesia. The plant was operated by Anorgana GmbH, a subsidiary of IG Farben, as were all other chemical weapon agent production plants in Germany at the time. Because of the plant's deep secrecy and the difficult nature of the production process, it took from January 1940 until June 1942 for the plant to become fully operational. Many of tabun's chemical precursors were so corrosive that reaction chambers not lined with quartz or silver soon became useless. Tabun itself was so hazardous that the final processes had to be performed while enclosed in double glass-lined chambers with a stream of pressurized air circulating between the walls. Four pipe fitters had liquid tabun drain onto them and died before their rubber suits could be removed. A worker had two liters of tabun pour down the neck of his rubber suit. He died within two minutes. Seven workers were hit in the face with a stream of tabun of such force that the liquid was forced behind their respirators. Only two survived despite resuscitation measures. The plant produced between 10,000 and 30,000 tons of tabun before its capture by the Soviet Army and moved, probably to Dzerzhinsk, USSR. In 1940 the German Army Weapons Office ordered the mass production of sarin for wartime use. A number of pilot plants were built and a high-production facility was under construction (but was not finished) by the end of World War II. Estimates for total sarin production by Nazi Germany range from 500 kg to 10 tons. During that time, German intelligence believed that the Allies also knew of these compounds, assuming that because these compounds were not discussed in the Allies' scientific journals information about them was being suppressed. Though sarin, tabun and soman were incorporated into artillery shells, the German government ultimately decided not to use nerve agents against Allied targets. The Allies did not learn of these agents until shells filled with them were captured towards the end of the war. Speer, who was strongly opposed to the introduction of tabun, flew Otto Ambros, I.G. 's authority on poison gas as well as synthetic rubber, to the meeting. Hitler asked Ambros, "What is the other side doing about poison gas?" Ambros explained that the enemy, because of its greater access to ethylene, probably had a greater capacity to produce mustard gas than Germany did. Hitler interrupted to explain that he was not referring to traditional poison gases: "I understand that the countries with petroleum are in a position to make more [mustard gas], but Germany has a special gas, tabun. In this we have a monopoly in Germany." He specifically wanted to know whether the enemy had access to such a gas and what it was doing in this area. To Hitler's disappointment Ambros replied, "I have justified reasons to assume that tabun, too, is known abroad. I know that tabun was publicized as early as 1902, that Sarin was patented and that these substances appeared in patents. (...) Ambros was informing Hitler of an extraordinary fact about one of Germany's most secret weapons. The essential nature of tabun and sarin had already been disclosed in the technical journals as far back as 1902 and I.G. had patented both products in 1937 and 1938. Ambros then warned Hitler that if Germany used tabun, it must face the possibility that the Allies could produce this gas in much larger quantities. Upon receiving this discouraging report, Hitler abruptly left the meeting. The nerve gases would not be used, for the time being at least, although they would continue to be produced and tested. At the end of World War II during the occupation of Germany, the Allies recovered weapons containing three types of German nerve agents, prompting further research into nerve agents by the former Allies. The Red Army captured a factory producing tabun at Dyhernfurth in early 1945, then dismantled the entire site and took it back to Russia. Stocks of tabun, sarin and soman were discovered by all the Allies within Germany, the Anglo-American advance seizing around 250,000 tons of chemical weapons. The subset of nerve agents (totaling around 30,000 tons) was split with the British, who took 14,000 tons of tabun-filled bombs, while the Americans took the remaining sarin-filled devices. The British-held bombs were eventually dumped at sea over 1955-56 as Operation Sandcastle. The fourth G-series nerve agent, cyclosarin, although discovered by German scientists studying organophosphates during WWII, was seemingly not found by the Allies, but independently rediscovered in 1949. 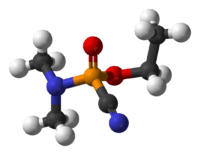 In 1952, researchers in Porton Down, England, invented the VX nerve agent, inspired by the commercial pesticide Amiton. The UK soon unilaterally abandoned the chemical weapons and chemical weapons research. In 1958 the British government traded their VX technology with the United States in exchange for information on thermonuclear weapons; by 1961 the US was producing large amounts of VX and performed its own nerve agent research. The four agents (VE, VG, VM, VX) are collectively known as the "V-Series" of nerve agents. Since World War II, Iraq's use of mustard gas against Iranian troops and Kurds (Iran–Iraq War of 1980–88) has been the only large-scale use of any chemical weapons. On the scale of the single Kurdish village of Halabja within its own territory, Iraqi forces did expose the populace to some kind of chemical weapons, possibly mustard gas and most likely nerve agents. In the Gulf War, no nerve agents (nor other chemical weapons) were used, but a number of U.S. and UK personnel were exposed to them when the Khamisiyah chemical depot was destroyed. This and the widespread use of anticholinergic drugs as a protective treatment against any possible nerve gas attack, have been proposed as a possible cause of Gulf War syndrome. One of the most widely publicised uses of nerve agents was the 1995 terrorist attack in which operatives of the Aum Shinrikyo religious group released sarin into the Tokyo subway system. Sarin gas was deployed during the 2013 Syrian Civil War, killing several hundred people. The prevailing world opinion is that forces loyal to the Syrian President deployed the gas, however the Syrian Government has denied responsibility for the attacks. In 1972, the United States Congress banned the practice of disposing chemical weapons into the ocean. 32,000 tons of nerve and mustard agents had already been dumped into the ocean waters off the United States by the U.S. Army, primarily as part of Operation CHASE. According to a 1998 report by William Brankowitz, a deputy project manager in the U.S. Army Chemical Materials Agency, the Army created at least 26 chemical weapons dump sites in the ocean off at least 11 states on both the west and east coasts. Due to poor records, they currently only know the rough whereabouts of half of them. There is currently a lack of scientific data regarding the ecological and health effects of this dumping. In the event of leakage, many nerve agents are soluble in water and would dissolve in a few days, while other substances such as sulfur mustard could last longer. There have also been a few incidents of chemical weapons washing ashore or being accidentally retrieved, for example during dredging or trawl fishing operations. ↑ Sidell, Frederick R. (1997). Medical aspects of chemical and biological warfare. Borden Institute, Walter Reed Army Medical Center. pp. 131–139. ↑ Sidell, Frederick R. (1997). Medical aspects of chemical and biological warfare. Borden Institute, Walter Reed Army Medical Center. pp. 147–149. ↑ Sidell, F. R (1974). "Soman and sarin: clinical manifestations and treatment of accidental poisoning by organophosphates". Clinical toxicology. 7 (1): 1–17. doi:10.3109/15563657408987971. PMID 4838227. ↑ Ellison, D. Hank (2007). Handbook of Chemical and Biological Warfare Agents. ISBN 978-0-8493-1434-6. ↑ Ellison, D. Hank (2007). Handbook of Chemical and Biological Warfare Agents New York: CRC Press (ISBN 978-0-8493-1434-6). Retrieved 2015-05-05. ↑ Ledgard, Jared (2006). A Laboratory History of Chemical Warfare Agents. ↑ Suspect CW Agent Production Plants, Dzerzhinsk, USSR, Changes Since 1962, CIA/NPIC, August 1963, declassified circa 1995, Corona: America's First Satellite Program, Kevin C. Ruffner, editor. ↑ Susan, Kinsley. "Whatever Happened To The Iraqi Kurds?". Human Rights Watch in Iraq. Human Rights Watch. Retrieved 20 July 2011. ↑ Bearden, David M. (3 January 2007). "U.S. Disposal of Chemical Weapons in the Ocean: Background and Issues for Congress" (PDF). U.S. Congressional Research Service. Retrieved 28 March 2012. Borkin, Joseph (1978). The Crime and Punishment of IG Farben. New York: Free Press. 1978. ISBN 0-02-904630-0, available for download in Australia (as it is out-of-print) see this link. E-Medicine. (June 29, 2004). CBRNE – Nerve Agents, V-series: Ve, Vg, Vm, Vx. Retrieved Oct. 23, 2004. E-Medicine. (June 30, 2004). CBRNE – Nerve Agents, G-series: Tabun, Sarin, Soman. Retrieved Oct. 23, 2004. C. H. Gunderson; C. R. Lehmann; F. R. Sidell; B. Jabbari (1992). "Nerve agents: a review". Neurology. 42 (5): 946–950. doi:10.1212/WNL.42.5.946. PMID 1315942.